The number of passengers using London Luton Airport passed 1.5 million in July. 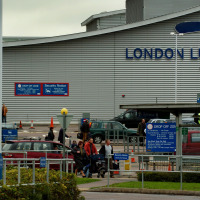 Passenger numbers at London Luton Airport (LLA) have risen ahead of expansion plans at the hub. The number of people flying out of LLA in July surged by an impressive 15.4% compared to last year, as the airport plans a number of expansion projects to support growing demand. The increase means 1.5 million passengers used the facility in July, but the new work will increase capacity to 18 million passengers. A new security search area has already been built while a new dual carriageway, access road and multi-storey car park are set to open within months. New proposals for a £200m light rail link from Luton Airport Parkway train station to LLA will cut journey times to the airport from central London. The plans, which will be funded Luton Borough Council, will see the introduction of driverless trains to transfer air passengers from the train station, replacing the current bus service which takes 15 minutes. It could cut journey times from London St Pancras to below 30 minutes according to the airport. Currently the shortest train journey from London to Luton Airport Parkway is 20 minutes from St Pancras International before passengers are forced to take a shuttle bus for the last mile of the journey. The 1.4 mile link will run 24 hours a day and connect with the airport's parking facilities. The service will be completed in 2020. Making travel "quicker and easier"
Chief executive Nick Barton said: "The summer holiday period is now in full swing. These latest figures show that more people are choosing to travel through LLA than ever before." There are plans to employ additional staff, offer two hours' free parking in the long-term car park, extend free Wi-Fi service and install device charge points. Mr Barton continued: "In the longer term, our £110 million redevelopment project will expand our security and immigration areas, introduce a host of new shopping and dining options and deliver major transport upgrades make travel through LLA quicker and easier." When flying from any airport the travellers are advised to take out trusted travel insurance to protect themselves against any unexpected flight cancellation or delays.